After a traumatic car accident, a high school student suffers from amnesia that conceals more than teenage angst in the dramatic Young Adult fiction novel What The Valley Knows by Heather Christie. Molly Hanover and her mother Ann have just relocated to Millington Valley. Ann's new boss has offered one of his superior rental properties to them for half the price. Happy to move out of the small, stuffy apartment, they are excited to begin their new lives. Ann has finally got her paralegal license and has a good job, and Molly is looking forward to her senior year. However, men recently introduced into their lives begin to cause havoc. After a late night visit from one of them, Molly now has a horrible secret. If she tells someone, the consequences could be dire. What should she do? However, that problem is moot when Molly is in an accident, and the memory is erased. Will the loss of her memory leave someone else in danger? What The Valley Knows by Heather Christie is a sensational Young Adult fiction novel that leaves the reader feeling empowered. The story takes the reader from tragedy to triumph as they observe the heartrending and traumatic circumstances that Molly and her mother encounter. It is uplifting to experience Molly's journey from emotions of grief and loss, to see how those feelings are transformed into promise and personal power. It is also very gratifying to see the villain, who is victimizing innocents, brought to justice. This sensational novel is a moving, poignant story and is ideal for readers over the age of sixteen, due to some of the adult content. Senior year at Millington Valley High School: parties, football championships, last big dances, and only months away from some serious life choices. Molly Hanover would have preferred to spend these days in a more secure environment, but life dictates that she be the “invisible” new girl. Which would be fine if she truly was invisible. Being a sousaphone player in the high school band offers her some respite from an otherwise awkward, and rather frightening, position when she attracts serious attention from both her mother’s boss and the football team's troubled quarter back. Molly finds herself in the middle of a triangle of deception that tests even her strong desire to be the obedient daughter and genuine friend. Molly really does want a boyfriend but she really does NOT want to deal with abusive advances from the man who holds her mother’s future in his hands. What the Valley Knows by Heather Christie offers an interesting twist to a common theme in young adult fiction. Christie’s use of relatable language and emotional angst offers the teen reader a clear understanding of life’s challenges. I especially appreciated the way the author handles a potentially predictable conflict. The main character is a well-defined champion of good intentions caught in a believable situation of confusion, recognizable to any teen reader. Heather Christie obviously knows her audience, from the perspective of both the reader and the writer. The dialogue is believable, authentic, and fluid. Character development is convincing, making this story an easy read. I thoroughly enjoyed What the Valley Knows. Christie has penned a highly emotional story for readers of all ages, especially deeming this a great addition to the world of YA! 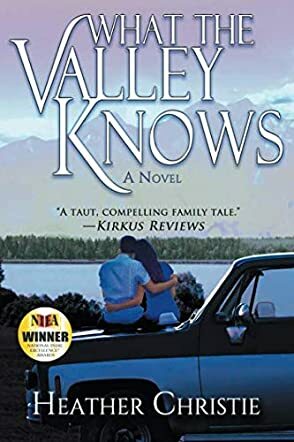 What the Valley Knows by Heather Christie is a fascinating story that brilliantly describes life in the small Pennsylvania town of Millington Valley. The setting is captivating, showing the pulse of the city, where kids drink, experience tough competition in school in areas of friendship, and where football is a revered sport. The arrival of Molly Hanover, a young, smart, and beautiful girl in town, stirs a lot of interest as she quickly captures the heart of the football team’s most coveted player, Wade Thornton. Their love is quickly tested from different angles, with friendships threatened and a popular cheerleader bent on setting everyone up against Molly. Things take a turn for the worse when Wade, drunk, plunges them into an accident that leaves Molly with a disfigured face. As she struggles with recovery, her memory coming back in fragments, she is certain that something horrible happened before the accident, and there is someone in Millington Valley who will do everything to stop her from learning what it is. Heather Christie’s What the Valley Knows is pulsating, a story with unique and compelling characters and a setting that comes out vividly. The writing is stellar and is a whole delight in itself, and readers will find themselves reading rapaciously from one page to the next fascinating page. The characters are beautifully imagined and well-crafted, immersed in a conflict that escalates pretty quickly, and ends in a satisfying denouement. This is a very interesting story with strong themes masterfully written into it, the kind of book you read and then find it hard to part with the characters.